As cold cases go, the disappearance of investigative journalist’s Choi Dae-ho (Soo Go) son Min-Woo (Kim Kang-Hoon) over three years ago could not have gotten much chillier. On their last day together father and son visited the local amusement park and in a now-you-see-him, now-you-don’t-moment, Min-Woo vanishes while riding on a carousel. Returning to the present, the lonely Dae-ho has become obsessed with finding his son. He finds a research laboratory webpage that describes “lucid dreams,” psychological epiphenomena in which heightened sensitivity makes the dreamer completely aware of being in a dream state. Dae-ho visits psychiatrist So-hyun (Kang Hye-Jun) and persuades her to put him into a lucid dream. She warms the journalist to limit his time to less than ten minutes and as Dae-ho begins to enter the dream world he “witnesses” his son being led away by a strange tattooed man. Dae-ho contacts police detective Bang-seop (Sol Kyung-gu) who reopens the case and gives him access to thousands of police files. Bang-seop is quite sympathetic since his young daughter is nearing death and needs a heart transplant. Recruiting amusement park workers to enter lucid dreams, Dae-ho gathers a few more clues but his progress is painfully slow. As Dae-ho’s search for his son progresses, he tracks down Yoo Sang-man (Lee Suk), an accomplice of the tattooed man, Choi Kyung-hwan (Suk-ho Jun), who abducted his son. 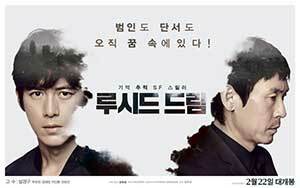 the following police search finds a shallow grave but it is not that of Min-woo. 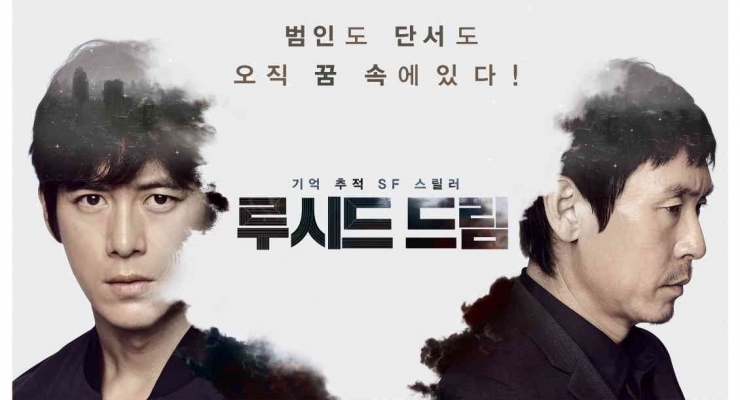 A possible breakthrough occurs when Dae-ho crosses paths with the wealthy Choi Myung-chul (Ho-chi Chun), the major sponsor of the lucid dream project. After Dae-ho’s paper exposed Choi’s son for avoiding of his military obligation, the young man died from injuries sustained in a car crash as his extremely rare blood type (the same as Min-woo’s) precluded his getting a life-saving transfusion. With help from another lucid dreamer, Kwon Yung-hyun (Yoo-chun Park), Dae-ho is able to enter other people’s dreams. He and Bang-seop enter the same dream, one from which only one of them may awaken, and the fates of their respective children hang in the balance. Kim Joon-Sung gives us an often exciting but quite uneven sci-fi film with obvious similarities to the plot premises and visual devices of the generally well-received Inception. Lucid Dream does have a more linear storyline than its predecessor and distills itself down to a pair of intimate family dramas of life-and-death situations. However, there is a stylistic awkwardness that first-time writer/directors like Kim seem unable to avoid. In an effort to incorporate some tried-but-true elements of dream versus reality storylines, the former are often given better treatment than the latter. A first-rate cast led by Soo Go does the best that it can with script and direction provided by this film debut of writer/director Kim. As a harbinger of things to come, watching this film might encourage cineastes to anticipate future movies from what I do consider to be a promising moviemaker. Lucid Dream is available for streaming now on Netflix. An Inception-like dream-reality sci-fi thriller that borrows heavily from its predecessor, but falls short in the areas of script and direction.